First, this post is about a civic web site. 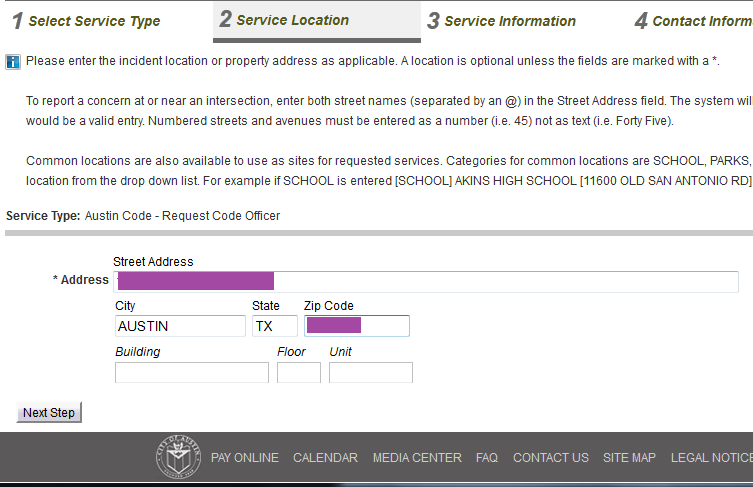 The circumstances of me filing a "311" report while a tourist in Austin are unusual, perhaps, though I have dealt with governmental data since college when I studied emergency response trends (fire calls) for a public facility siting project. My home town recently fired their "CityStat" data czar after lack of progress, perceived or actual. We shopped in downtown Austin during our vacation; I won't include specific location or observations as they aren't relevant to the post. I'm expecting the City of Austin to follow up on my report; afterwards I will attempt to communicate my reaction to their web site. I noticed what could be a dangerous situation inside a private business, recorded images, and made a mental note to alert the appropriate authorities. Saturday, when Austin had their Pride Festival, my wife and I watched a slide show on LBGT history, including details on what was described as the worst arson attack in New Orleans history. There's a recent film about it called Upstairs Inferno. That catalyzed my decision to report what I saw. 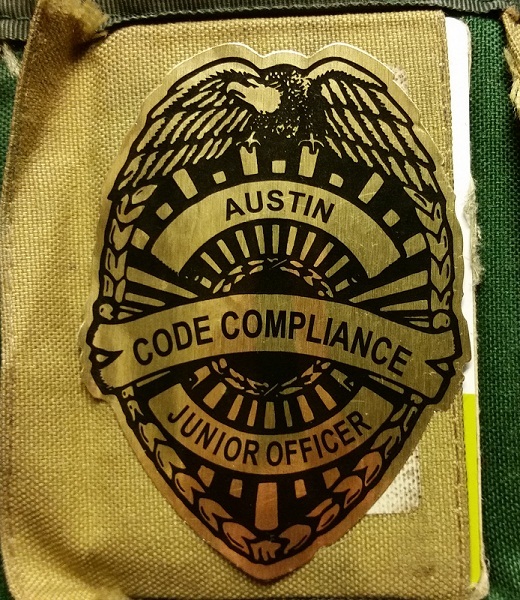 Also, serendipitously, the festival included a booth for Austin's Code Compliance agency (where I picked up the souvenir "Junior Inspector" sticker). I considered myself deputized. I went with the online web entry instead of phoning it in as it was the weekend. What follows is a critique of the process. 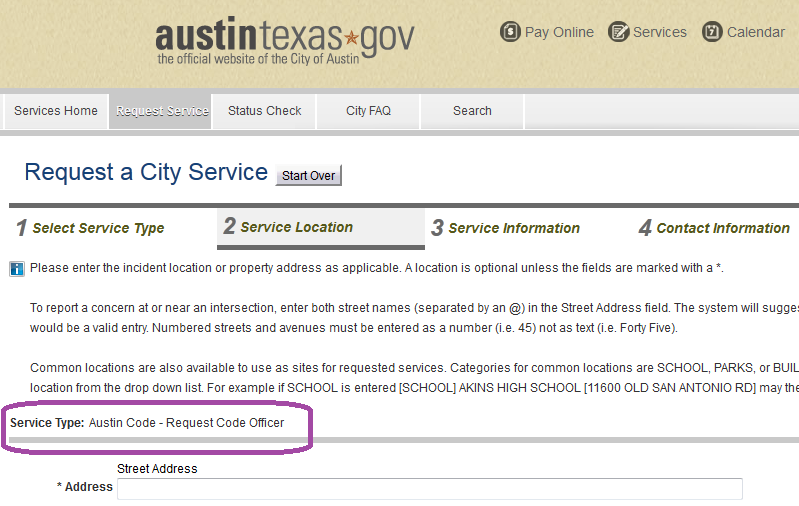 I found the proper site easily (Googled "austin code compliance", go to austintexas.gov/department/311 ) and filled in relevant information. Name, address, phone number, basic stuff. Thinking through what the professional code inspector might need, I debated which of several email addresses I might supply. This led to one major error. There was not a specific service choice that met the situation I was reporting, though there were a lot of choices. 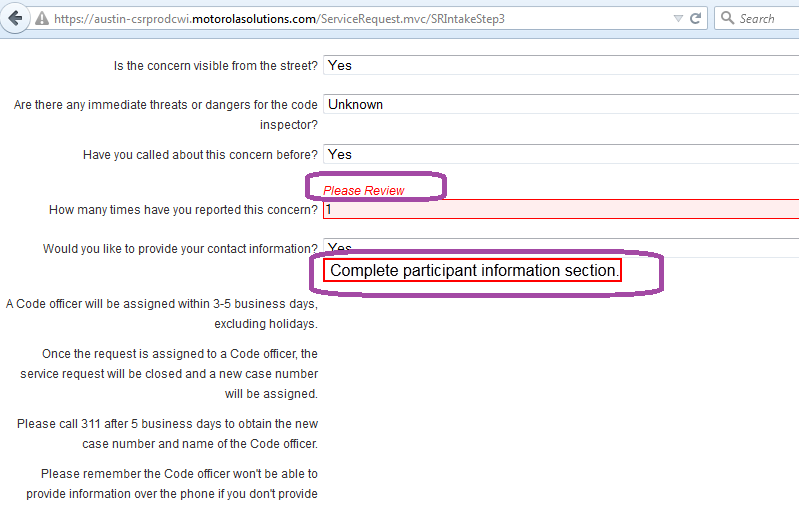 I ended up picking "Request Code Officer" as that seemed to be the best catch-all for "none of the above." The site I eneded up on, by the way, is austin-csrprodcwi.motorolasolutions.com - quite a mouthful, and not an easy URL to communicate to the general public. Maybe austintexas.gov/311 would work as a shortcut? The site pre-filled Texas in the location field. I had to google the address I was reporting, which fortunately I had remembered. So far, so good. This is the fourth screen I had to navigate through, and though I could not tell, I was not near the end. The web designers presumably chose to break all of the required data into parts so that individual entries could be verified piecemeal instead of en masse. Not a horrid experience, but correcting something on an earlier screen if more difficult as more steps are completed. 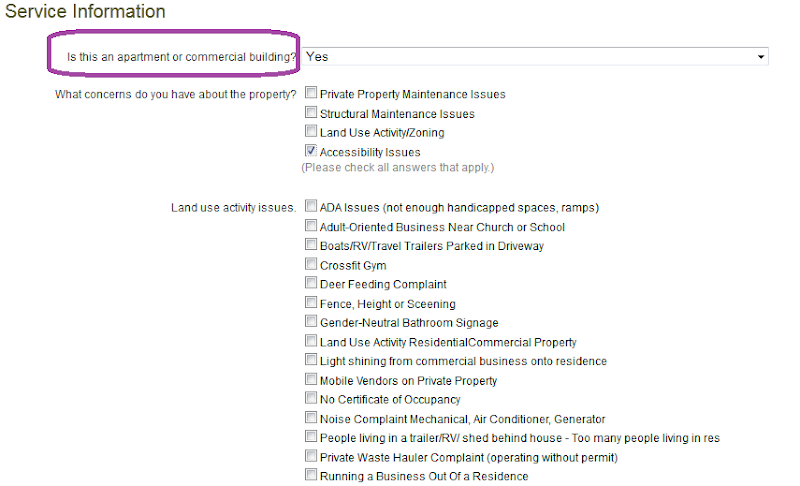 I entered "Yes" for "Is this an apartment or commercial building". I figured I was done, but I will come back to this question. Below that was an exhaustive and exhausting list of choices. 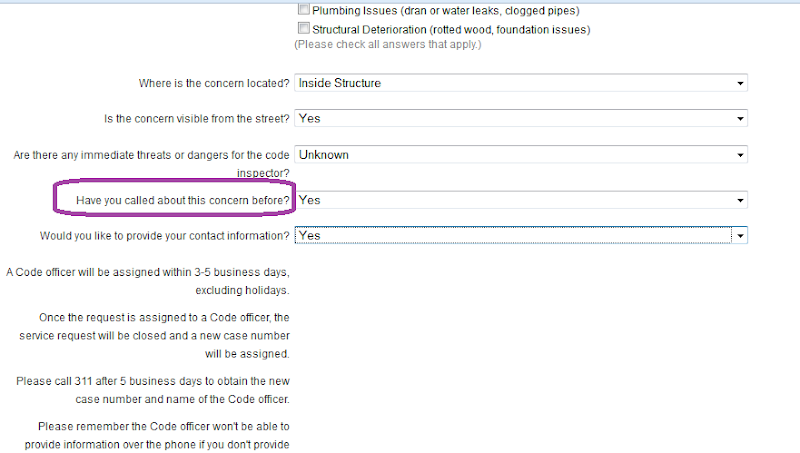 As an IT professional, I could guess these are check box fields that might be tricky to expand or modify after creation. 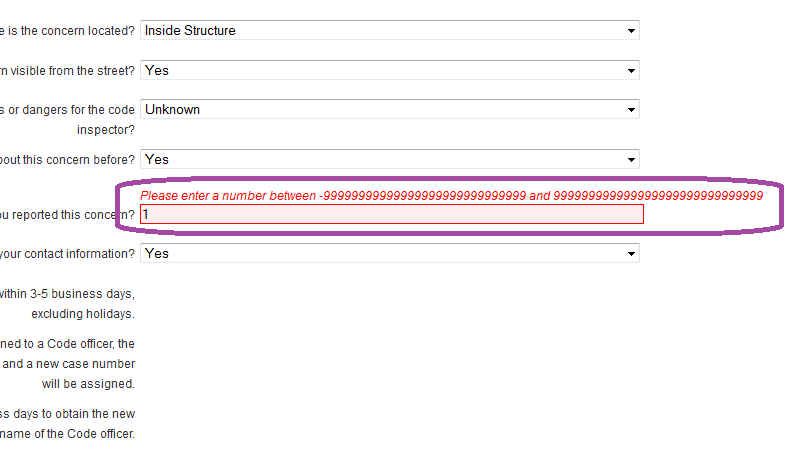 There are most likely had-coded field names to go with these in the underlying database. My actual concern, sadly, was none of those fields, forcing me to choose "Accessibility issues" as the closest I could get. People unfamiliar with English, or with less governmental exposure, would probably give up before getting past here. Points off for spell check failure on "Fence Height or Sceening". 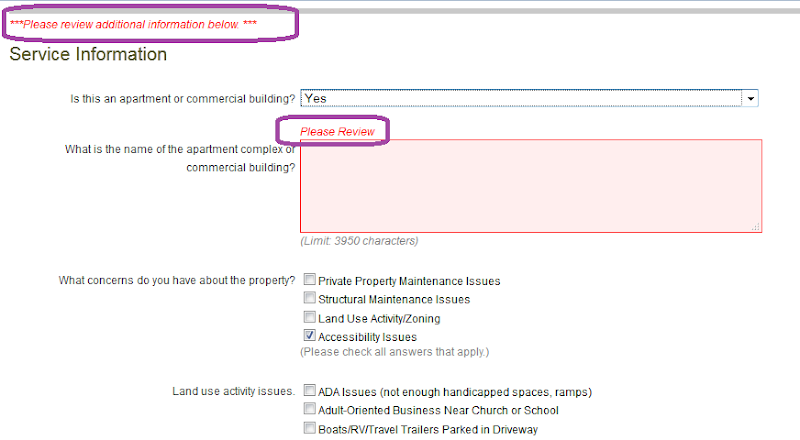 This page asked if I had complained about this issue before. Didn't need this the first time through the process, but I did on the second, and third. While I had already answered this is a commercial establishment, this screen pushed me backwards to provide more detail. The red lettering imply it's my fault for not filling them in earlier, yet the entry box did not appear until after I went forward. Because I neglected to provide an email address on an earlier screen (IT WAS NOT MANDATORY), I had to start my entry process from the beginning (see Exhibit H). How many times? 1 is what I entered. Who would ever enter a number zero, or less, to the question, how many times? And "Complete Participant Information Section". Wouldn't "tell us about yourself" be simpler? And where is that to be found anyway? A "valid email address" is required. Which I forgot to include (see above). But "to lookup status"? Hm. Lookup is not a verb. So says the web site notaverb.com. As Maury Allen said, "you could look it up." Or was it Thurber? Bottom line - typos, poor navigation, and a road-block value check made this experience not so easy for me. Hopefully, there's a newer version under development, and more testing and checking will be done.